ARBUTUS – Jack Pundt can do it all. Pundt’s passion for the job dates to the 1960s. Like his two grown sons, he attended OLV School. He began working there even before he entered Mount St. Joseph High School, where he was in the class of 1971. His passions include being a toy locomotive hobbyist, one with 19 sets of trains. “I’ve got this thing about trains,” he said. One of those sets is in the school lobby, a display Pundt put together while students were on Thanksgiving break. “I worked on Wednesday, Friday, Saturday and Sunday,” he explained. 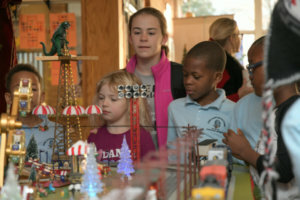 His personal train set collection has become an Advent tradition at OLV, putting students in the Christmas spirit. 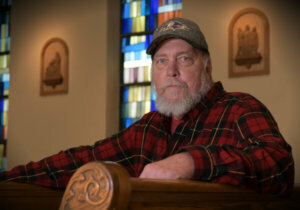 Pundt has been on the alumni board at Mount St. Joseph for more than 22 years, and claims St. Joseph, the patron of woodworkers, as his favorite saint. During Lent, the principal asked Pundt if he could build a cross as a part of a school program to help support “Kids Helping Hopkins,” which benefits the John Hopkins Children Center. He responded by building a wooden cross almost 6-feet-tall. “All of the students, faculty and staff, we all put our fingerprints on the cross,” Gorman said. “And that’s hung up in my office right now. He really takes a lot of pride in the work that he does. He is meticulous. ”Pundt also works at the parish level on weekends. The project he is most proud of was framing the original Stations of the Cross inside the church, which took nearly two months to complete. Gorman praised Pundt’s work ethic, which she said is a perfect example of faith in action. His service is especially appreciated by OLV students this time of year. Originally from Panama City, Panama, Ricardo "Rico" De Silva holds a bachelor's degree in journalism from Radford University in Radford, Va. 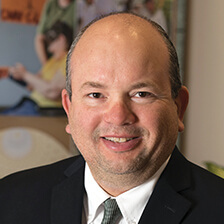 Prior to coming to the Catholic Review as a bilingual staff writer in December 2017, Rico worked as the Hispanic communications reporter for the Catholic News Herald, the newspaper for the Diocese of Charlotte, NC., from September 2013 until May 2017. Prior to his post with the Catholic News Herald, Rico ran his own Spanish interpreting company in the Charlotte area, as well as working as a freelance writer for a local Charlotte weekly newspaper.